Twenty-five years ago was the 1991 NHL Entry Draft. 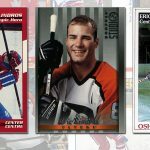 Just like Austin Mathews today is unanimously considered the best prospect in this year’s draft, everyone in 1991 thought the same of Eric Lindros. Lindros was considered “The Next One” since he was 14 years old. And who could argue? He was 6’4″ and 230 pounds. He scored 149 points in 57 games during his last season of major junior hockey. Lindros was a dominant force that could control the game. But would NHL scouts and GMs spend a first-overall pick on The Big E, or someone else, knowing then what we know now? So, let’s imagine that we could re-do the first round of the 1991 NHL Entry Draft. 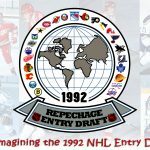 Let’s set our Wayback Machines to June 22, 1991, pack an iPad with Hockey DB and Hockey Reference already bookmarked — we’ll worry about finding a WiFi hot spot when we get there — and see how the first round of the 1991 Draft would have played out in our alternate timeline. Peter Forsberg (C), originally selected 6th overall. Custom card by Shellie Lewis. Why: The million dollar question — or really, $15 million question, considering that’s how much cash the Nordiques got for Lindros — is if Eric Lindros was worth more as a player or as trade bait? Lindros did not want to play for the Nordiques and opted to play for the Canadian National Team in 1991-92 instead. So Quebec ended up trading Lindros to the Flyers for Peter Forsberg, Ron Hextall, Kerry Huffman, Mike Ricci, Chris Simon, Steve Duchesne a first round pick in 1993, a first round pick in 1994 and $15 million cash. Obviously, the Nords made bank on that trade and laid the groundwork for two Stanley Cup Championships, albeit as the Colorado Avalanche. The Flyers did make it to the Finals once, but were swept in four games. Forsberg isn’t the highest-scoring player from the 1991 Draft, as injuries curtailed his career towards the end and he retired after the 2010-11 season. But consider what he accomplished in 708 NHL games: he won the Calder Trophy as rookie of the year in 1995, the Art Ross and Hart Trophies in 2003, was third in points for 1991 draftees with 885, second in assists with 636, had the highest points-per game with 1.25 and the highest plus/minus of any 1991 draftee with +238. Forsberg was also a big part of the Avlanche’s two Stanley Cup Championships in 1996 and 2001. Ask anyone today who they’d rather have on their team, Lindros or Forsberg, and the answer would be easy. Scott Nieermayer (D), originally selected 3rd overall. Why: Niedermayer was easily the best defeneman from the 1991 draft. He was tops among 1991 d-men in games played (1263), goals (172), assists (568) and points (740). Niedermayer was the cornerstone of four championship teams. Plus, he won the Conn Smythe Trophy and the Norris Trophy — the only draftee from 1991 to win either of those awards. While his career certainly would have been different in San Jose, Neidermayer still could have been a force on their blueline for many years. Eric Lindros (C), originally selected 1st overall. Why: If you compare the career of Lindros to those of his peers from the 1991 Draft, he’s not tops in any category. In fact, he’s 4th overall in goals (372), 5th overall in assists (493) and 5th overall in points (865). So, why not draft a higher-scoring player instead? Lindros’ career was cut short due to concussions, but consider that Lindros scored 885 points in 760 games. That puts him at 1.13 points-per-game, second only to Forsberg. Keep in mind that Lindros sat out the entire 1991-92 and 2000-01 seasons by his choosing; had he played those two years, his numbers would be even higher. I would rather have a big, dominant center like Lindros on my team for 760 games than, say, Alexei Kovalev or Ray Whitney, who scored more points only because their careers were much longer. Finally, consider the “butterfly effect.” If Lindros is drafted by the Devils, then he never gets hit by Scott Stevens, as they would have been teammates. That hit was the turning point in Lindros’ career, which declined from there. Had that hit not happened, who is to say that Lindros’ career could not have been much longer, and much more productive. Alexei Kovalev (RW), originally selected 15th overall. 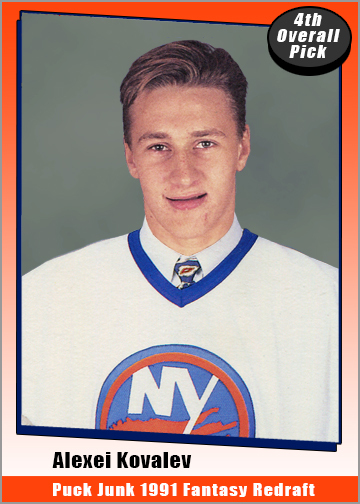 Why: Of all 1991 draftees, Kovalev is 1st in goals with 430; he’s the only pick from 1991 to surpass 400 goals. He is also 2nd in his draft class with 1029 points and 3rd in assists with 599. All fantastic numbers, but I’d still rather have Forsberg, Niedermayer or Lindros on my team. 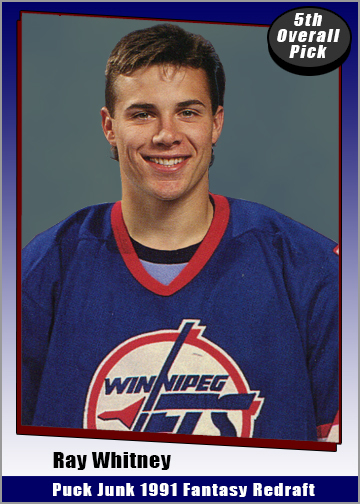 Ray Whitney (LW), originally selected 23rd overall. Why: Whitney’s career is interesting because he got better with age. Because he played so long — he retired in 2014 at age 42 — and was so consistent, he was the highest scorer of the 1991 draft class with 1064 points. He was also tops in assists (679) and 3rd in goals (385). Whitney did all this despite being in the minors for three seasons during the early part of his career. And even in his 30s, Whitney played at a high level, leading his team in scoring while 35 years old, and again at 37. Chris Osgood (G), originally selected 54th overall. Why: Osgood was the best goalie in the 1991 NHL Draft, and the only one to win 400 games, with a record of 401-216-95. He had a career GAA of 2.49, won the Jennings Trophy twice and was the starting goalie for two of the three Stanley Cup-winning teams he played for. With the best scorers, best defenseman and best goalie now gone, determining the next 16 picks is much trickier, so other qualities had to be considered. Markus Naslund (LW), originally selected 16th overall. Why: Naslund may be the “best available” player at this point, as he was 4th among 1991 draftees in points (869) and 2nd in goals (395). He never fit in with the Penguins, but his career really blossomed when he was traded to the Canucks in 1996; coincidentally for Alek Stojanov. In Vancouver, Naslund was their captain for eight seasons and their leading scorer for seven. 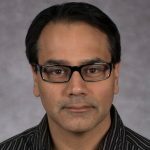 Had the Canucks drafted him in 1991 instead of trading for him in 1996, they could have had another five quality years with one of their team’s all-time greats. Also, I wonder if Penguins fans quietly sob themselves to sleep at night when reminded of the Alek Stojanov for Markus Naslund trade? Zigmund Palffy (RW), originally selected 26th overall. Why: Palffy is the only other 1991 draftee to score more than a point per game (1.04) and was one of the few bright spots on the Islanders during their “fish sticks” era, as well as on the Kings in their late 1990s “post-Gretzky” era. Overall, Palffy is 8th in points with 713 in 684 games played and 7th in goals with 329. Sandis Ozolinsh (D), originally selected 30th overall. Why: Osolinsh was an offensive defenseman who had the second-most points of any 1991 drafted d-men with 564 in 875 games played. He was a First Team All-Star once and a seven-time participant in the All-Star Game. After Niedermayer, Osolinsh was the next-best defenseman. Brian Rolston (LW), originally selected 11th overall. Why: Rolston was 5th in goals (342), 9th in assists (419) 6th in points (761) and 4th in games played (1256) for 1991 draftees. So he definitely fits as a mid-first round pick. However, Rolston grew up in Ann Arbor, Michigan and played youth and college hockey in Michigan. The Red Wings no doubt would have loved to have a home-grown talent like Rolston, who probably would have loved playing for his hometown team. Michael Nylander (C), originally selected 59th overall. Why: With Rolston no longer available for the Devils to select, the next-best player is Nylander, who was 8th in assists (470) and 9th in points (679) among players drafted in 1991. A Devils team with Lindros and Nylander would have been stacked at center. Who they would have picked instead: Alexei Zhitnik (D), originally selected 81st overall. Why: Zhitnik is 3rd overall among 1991 defensemen in goals (96), assists (375), points (471) and games played (1085). Mike Knuble (RW), originally selected 76th overall. Why: Knuble is 8th in goals (278) and games played (1068) among 1991 draftees. He didn’t become a regular NHLer until he was 25, yet was good enough to play in the league until he was 40. Yanic Perreault (C), originally selected 47th overall. Why: Yanic Perreault was a player who was projected to get drafted in the first round of the 1991 Draft, but for one reason or another fell to the third round. Looking back 25 years later, Perreault should have been a first-round pick, not a third rounder. He was 10th overall in goals (247) among players in his draft class. But more importantly, he was the best player in face-offs won from 1997 to 2008, according to this archived article. Perreault won 60.9% of all draws he took from 1997-98 — the first year the NHL tracked that stat — until his retirement after the 2007-08 season. Who here doesn’t like winning face-offs? Jozef Stumpel (C), originally selected 40th overall. Why: With Kovalev going to their cross-town rivals in this fantasy draft, and a lot of other high-end talent gone, the Rangers would have to go with Stumpel, who is 6th in assists (481) and 10th in points (677) for 1991 draftees. Philippe Boucher (D), originally selected 13th overall. Why: Boucher was the fourth-best defensemen taken in the 1991 NHL Draft, scoring-wise, with 300 points in 748 games played. For what it’s worth, Boucher was also 3rd among 1991-drafted defensemen in plus/minus with a +57 rating. Sean O’Donnell (D), originally selected 123rd overall. Why: The Habs’ defense had no real depth after Mathieu Schneider and Peter Svoboda, so maybe a consistent d-man like Sean O’Donnell could have helped. 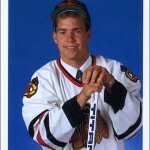 O’Donnell is 2nd among defensemen drafted in 1991 in games played with 1224. In fact, he’s 5th overall in games played among all players drafted in 1991, regardless of position, and played until he was 41. O’Donnell is also 2nd overall among 1991 defenders in plus/minus with +87. By the way, Brent Bilodeau is the only first round pick to not play in a single NHL game. 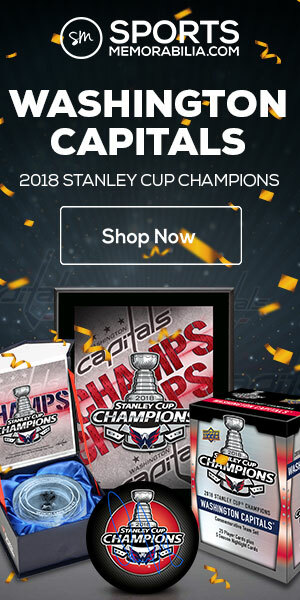 How does that make you feel, Habs fans? The Bruins still would have selected Glen Murray. 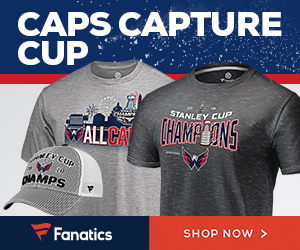 Why: Murray — who is 6th overall in goals (337) among his 1991 peers — is actually a perfect pick late in the first round. 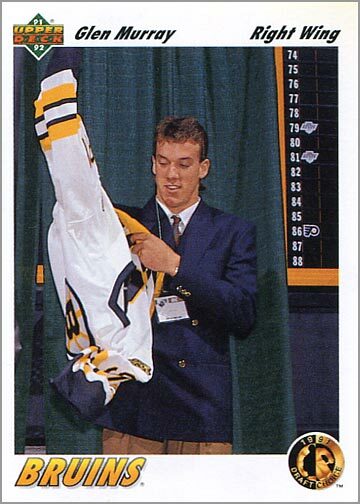 The Bruins drafted him in 1991, traded him away in 1995, then re-acquired him in a trade in 2001. If he was selected by any other team in this fantasy draft, the Bruins would still find a way to get him back on their team. 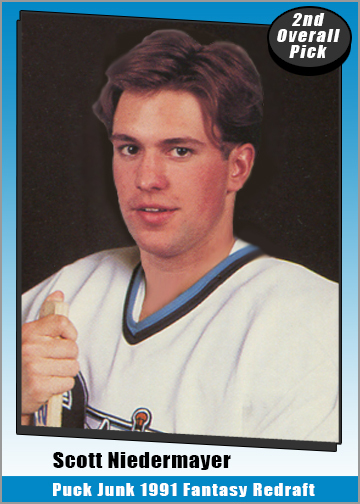 That, and the fact that I really like Glen Murray’s rookie card. Why change a good thing? 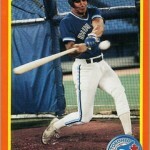 Glen Murray’s actual rookie card. Aaron Ward (D), originally selected 5th overall. Why: Ward is still first-round material, but he’s more of a late-rounder than a 5th-overall pick He played in 839 NHL games, which was 5th among defenders picked in ’91. That may sound like a laughable stat until you consider that 87 defensemen were drafted in 1991, but only 27 of them played in one or more NHL game — and only 17 played in over 100. Suddenly, being the 5th best d-man in the room isn’t such a bad thing. The Oilers still would have selected Martin Rucinsky. Why: Coincidentally, Rucinsky is the best player still available in our alternate timeline fantasy draft. Among the 1991 draftees, he finished 12th in points with 612 (241 G, 371 A) in 961 games played over 15 seasons. Dean McAmmond (C), originally selected 22nd overall. Why: McAmmond only moves up one spot in this mock draft, but rightfully so. 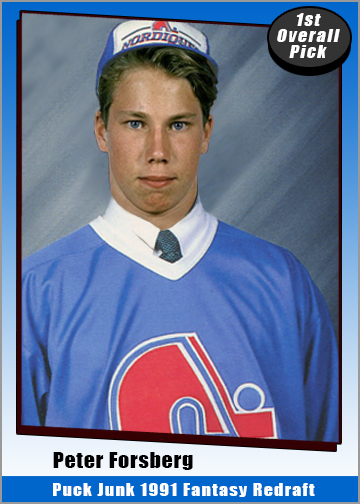 He is the 17th-highest scoring player out of the 100 skaters drafted in 1991 to appear in the NHL. Steve Staios (D), originally selected 27th overall. Why: Staios is 10th in games played among 1991 draftees, having skated in 1001 NHL games. He also served as the team captain of the Atlanta Thrashers for a season. What makes him a unique choice for the last pick in the first round is that Staios changed roles, switching from defense to right wing, midway through his career. That kind of versatility is a good quality to have as an NHL player. Though not particularly remarkable as a defenseman or as a winger, Staios did outlast the other 90 drafted players who appeared in at least one NHL game. One interesting thing to note is that in this fantasy re-draft, 50% of the players — exactly 11 — who were selected in the first round back in 1991 are still selected in the first round here, albeit most in different places. The same thing happened in the fantasy re-draft I did of the 1990 draft last year, where 10 players picked in the first round were good enough to be first rounders, but the other 11 weren’t. What’s the point I’m trying to make here? Maybe it is that scouts, GMs and other NHL people tend to get things right half the time when it comes to first-round picks. Seeing as how this is an inexact science, with so many factors to consider, being right half the time is actually pretty good. But it is easy to second-guess someone 25 years later, and this was all in good fun. Had the draft happened in the order I propose here, things would have been interesting, to say the least. 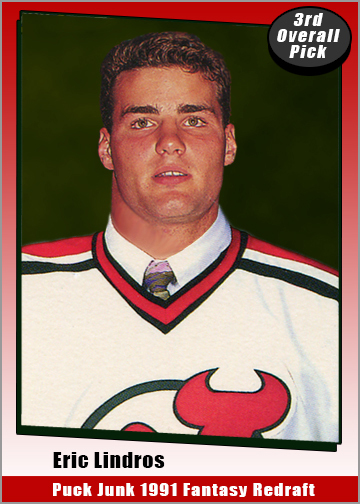 Maybe the Devils would be retiring 88 in honor of Lindros, their franchise center. 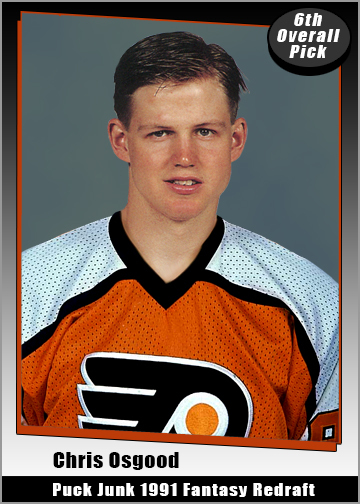 Or maybe Chris Osgood could have been the great goalie that the Flyers lacked since Ron Hextall. Or maybe Scott Niedermayer would finally be calling it a career after helping the Sharks beat the Penguins in the 2016 Stanley Cup Finals. That said, please leave a comment, and let me know what you think. I’ve always been fascinated with “re-drafts”. Terrific article. Well thought out, especially with the Lindros “hit”. I’d completely forgotten that. Although, already having Sakic and Sundin at center, Quebec picks Niedermayer over Forsberg. Man, I miss the Nordiques. Huge shout out to Shellie for her stellar work. What is fun to think about is how if the Flyers had passed on the deal, would they have won the cup with the pieces they hadn’t traded away? The Nords were smart to take him because it ended out well, but had they not won the cup, would we look back as favourably as we had on the deal to move Lindros? As for Forsberg or Lindros, I would still rather have picked him – at the time, he was as sure a thing as one would get. The butterfly effect on Lindros – Your bang on with Stevens, however I also believe that the Kasper hits took their toll as well. Being in NJ, he would have played the Penguins in the mid to late 90’s just as much as he did and the odds of getting drilled were as good. Always felt bad for Pat Falloon. Hardworking guy, should have done better and likely would have on a more established team where he wasn’t hung out to dry. I don’t know about your suggested pick for the Pens though. 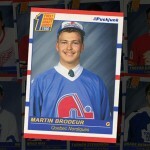 I liked the Naslund pick as a kid, but given your assumptions, I would have preferred Glenn Murray. 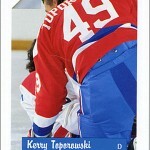 I always loved his playmaking abilities and hockey sense and he would have gelled nicely with the offence at the time. Granted he ended up their briefly a few years later but if we’re looking at butterfly effect again, perhaps Stevens is never traded and therefore never ends up with the substance abuse problems quite like he ended up with in NY. Granted he was never the same after that hit in the 93 playoffs, but a Pens fan can wonder. urgh Stojanov – I’m a Pens fan….you probably know how I feel about him…. Great redraft and I think as a Devils fan we would have been happy to have had Lindros and Nylander. It always amazes me how Forsberg and Lindros were apart of that amazing trade and in hindsight I doubt the Flyers would have made that trade straight up, let alone all they gave up for land the Big E. Regardless, both Hall of Famers and amazing talents.